The U.S. just recently went through the 2018 mid-term elections, with voting day always occurring on the first Tuesday in November. But there is another national campaign that takes place the first week of this month—National Corporate Compliance and Ethics Week (NCCEW). Oddly enough, the two go hand-in-hand, especially for those in government contracting. With the first, the American people celebrate their right to choose candidates that best reflect their values. With the second, companies—such as CNSI—use this week to celebrate their own corporate values and their commitment to doing the business the right way—every day. And this comes from creating a strong culture of compliance. So, how does a company create that culture? Well, here at CNSI we incorporate compliance and ethics into everything we do—from the proposals we write, to the way we manage our projects, to the treatment of our employees, colleagues and clients to the communications we send. Throughout the year, we hold related trainings on hot compliance issues (e.g., creating a harassment-free workplace); schedule chat and chews for managers; and provide regular updates on company policies and best practices. NCCEW gives us the opportunity to spotlight the efforts from the past year. Speaking of years, we are in now on our fourth year of NCCEW participation. Throughout the week, CNSI has shared daily policy reminders, invited employees to play our “Escape Room” compliance quiz, updated our Code of Ethics and Business Conduct, and distributed our annual Code of Ethics training. 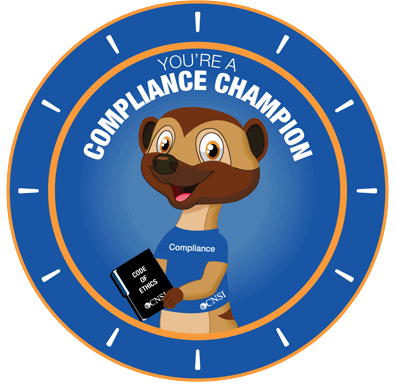 Tomorrow, we close out the week with our Compliance Champion Celebration. Since compliance is everyone’s responsibility, everyone is a champion—which means cupcakes, cool giveaways, and time with colleagues. We also check in on other companies to see how they are supporting NCCEW. Have something cool and interesting your company is doing to create a culture of compliance? Share with us at @CNSICorp!